In a large bowl gently but thoroughly combine the ground beef, salt, pepper, cumin, paprika, and chili powder. Gently form the meat into four 6 ounce patties, about 1/2-inch thick, and place on a plate. Refrigerate the burgers, covered until needed. Preheat broiler or grill. Char the chiles on all sides, turning occasionally with tongs, about 5 to 10 minutes. Transfer blackened chiles to a large bowl and cover tightly with plastic wrap. Let stand for 30 minutes or until cool enough to handle. Wearing rubber gloves, peel the chiles. Trim off stems, slice in half and discard seeds and ribs. Coarsely chop the chiles. In a saucepan heat the oil over moderate heat and cook the onion until soft. Add the garlic and cook for another minute. Add the flour and cook for 2 minutes, stirring to coat. Slowly add the water, stirring to combine, and bring the mixture to a simmer. Stir in the chiles and cook until thickened. Season to taste with salt. Keep warm. Cook the burgers to desired degree of doneness. Top each burger with a slice of cheese and cover, cooking until cheese melts. 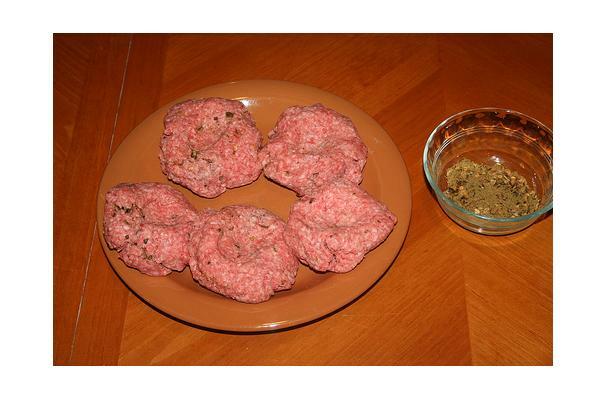 Transfer each burger to a bun and top with chile mixture. Serve immediately.